Applications are invited for National Disaster Management Authority Recruitment-Technician/Consultant/Sr. Research Officer (21 Posts). 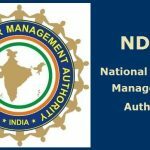 National Disaster Management Authority (NDMA), Delhi invited applications for the post of Senior Senior Research Officer, Technician, Senior Consultant on contractual basis. Eligible candidates can apply to the post in the prescribed format within 45 days (28 May 2019) from the date of publication of advertisement. The Eligible candidates can apply to the post in the prescribed format and send the application along with other necessary documents to “Under Secretary (Admin), National Disaster Management Authority , A-1, Safdarjung Enclave, New Delhi – 110029” within 45 days (28 May 2019) .